70% of Achilles Tendons that rupture have been completely asymptomatic prior to rupture. So if your tendon is sore you have a decreased chance of rupture. For insertional tendinopathies, reduce compression ASAP. 4cm heel raise until pain is under control then gradually decrease this. 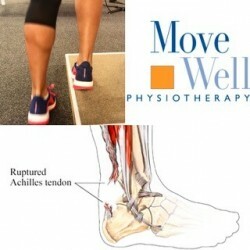 Contact your Move Well Physiotherapist today If you are struggling with Achilles tendon pain. Move Well physiotherapists can assist in diagnosis, treatment and rehabilitation from tendon associated injuries like Tennis elbow & Golfers elbow plus Patellar, Achilles and Plantar fascia problems.